Today we got a glimpse of the sun up north, when skies started to clear up briefly in Beloit and Poplar Grove. Everyone else saw cloudy conditions for most of the day, but we all get to see more of that sunshine tomorrow and the next few days as we will have partly cloudy conditions for the rest of the work week. The clouds will start to clear tomorrow morning, but will stick with us until then. A few gusts of wind are also expected tonight, but there won't be as many gusts as we've had the past few nights. Temperatures will be in the low 20s tonight, and will warm up to the low 30s by the time the skies start to clear. A weak cold front will move through tomorrow around noon, pushing temperatures back down into the twenties for the remainder of the week, but at least we get to see that sun for the remainder of the week. To say snow has been hard to come by during the month of January would be an understatement. As of January 31st Rockford has only recorded 0.7" of snow, nearly 10 inches below average. With the monthly snow total falling below one inch, this will likely place January 2017 in the top ten list of least snowiest January months on record. It's been quite a surprise considering how much snow occurred during the month of December. A quick glance at the beginning of February shows a brief warm up followed by another cool down late next week. But there appears to be no big snow systems on the horizon. The warm front moving through our area will keep temperatures warmer in the overnight hours. This usually doesn't happen because temperatures decrease as we get into the night. However, when a warm front moves through it night, it disrupts the diurnal flow causing the temperatures to get warmer at night instead of during the day. This front will bring a light snowfall and keep temperatures a little warmer up until Tuesday evening. Wind speeds are going to pick up as we get into the overnight hours, with wind gusts peaking at around 25mph. These higher wind speeds will continue into tomorrow, so make sure you keep the winter coat handy as wind chill temperatures will be about 10-15 degrees below what the actual temperature is. The skies have cleared!!! At least temporarily. But what a sight to see on a Monday morning. Clearing skies overnight allowed temperatures to drop into the single digits and low teens. Winds remain light Monday morning, but then increase through the afternoon from the southwest. This will bump temperatures into the low 30's by late this afternoon. A fast moving low will move out of Minnesota and into southern Wisconsin by this evening. Most accumulating will occur over Wisconsin, with totals adding up under an inch closer to northern Illinois. Unfortunately, skies will remain cloudy tonight and Tuesday. But we should begin to see more sun by the middle to end of the week. Our next chance for snow will come on Monday as a Clipper System originating from far northern Canada moves through. We should expect light snow and flurries to move through starting at noon and continuing off and on through the early evening hours. Most of our area will see a trace to a couple tenths of an inch. Areas to the North and East could see up to 1/2 an inch. The predominant flow of air masses and weather systems right now is coming from the Northwest and when storms approach from those areas, they typically have less moisture associated with them. The Northwest flow is expected to change later next week to more of a west to east flow, giving us additional chances for snow that could tap gulf moisture - the source region for more significant snows. Temperatures over the next couple of weeks will be at or a little below normal - supporting increased chances for snow as well. Have a great start to your work week! Light snow accumulations were noticed this morning, for Rockford the total was about .5". It has caused a few slick spots on untreated roads. But when it comes to snow totals, we're running low. Up until last night, Rockford received only a half inch through the month of January. With the recent light snow, our monthly total is about 1"...but the average for this point in the month is 8.6"! That puts the area at a snow deficit of 7.6". Accumulating snow through the next 7 days is also very low, we'll just keep scattered light snow showers through the next several days. Any accumulations will be minor through the start of next week. By the end of the month, in just a couple days, the monthly snow total average is over 10". The Climate Prediction Center outlooks the southern half of the country, along with portions of northern Illinois with a 30-40% probability of drier than average conditions. 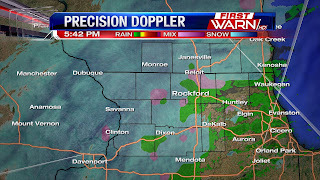 A Winter Weather Advisory continues until Midnight for Green, Rock and Walworth counties in southern Wisconsin. 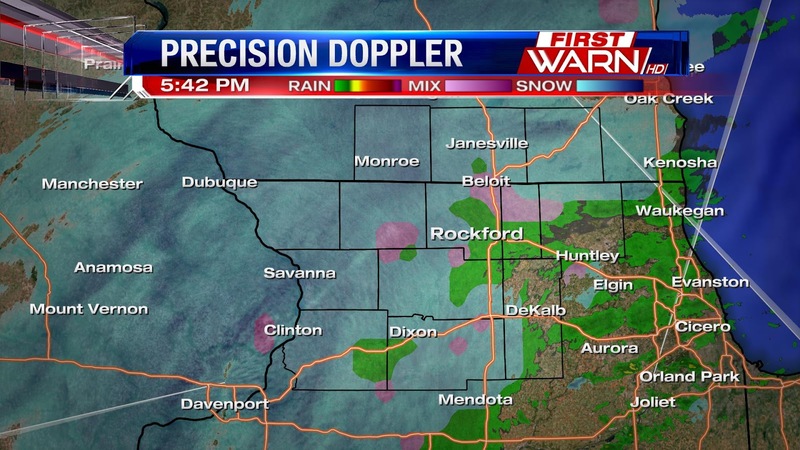 Earlier rain and drizzle has switched over to light snow for most of the Stateline Wednesday evening. A complete transition over to snow will occur after 7pm. Accumulations will remain light, most falling within 1" to 2", however higher amounts may occur to the north where snow fell Tuesday night. Ground temperatures should allow the snow to melt initially on contact, but some roads may become slick through the late evening and overnight. Use caution early Thursday morning as temperatures will have fallen down below freezing. Additional flurries and light snow will occur Thursday morning, and then again Thursday afternoon. Little accumulation is expected with that. Temperatures will be falling this week, but there still aren't any major snow falls in the forecast for the Stateline area. A deep low pressure system currently in the Rockies will head east today, moving into the Plains this afternoon, before arriving overhead Wednesday afternoon. The heaviest of the snow will fall just to the north of the low pressure track, and this will drop high accumulations across South Dakota, Nebraska, northern Iowa and into western Wisconsin. Snow could pile up over 10" in northwestern Iowa, and 4-7" inches of shovel-able snow for western Wisconsin. Winter Storm Warnings and Winter Weather Advisories have been issued ahead of this storm already. Closer to home, 1-3" will be possible near Madison, and near 1" is a good bet in southern Wisconsin. Green County in Wisconsin is the only Stateline county that has a Winter Weather Advisory issued for it. It will go into effect at 6pm Tuesday night and will expire at 6pm Wednesday. Northern Illinois will recieve just minor accumulations, near quarter inch by Wednesday. But first, light rain will arrive around dinner time tonight, and will then mix with light snow overnight tonight as temperatures fall into the low 30's. Little to no accumulation expected by tomorrow morning. Light drizzle is possible Wednesday morning before another rain/snow mix arrives tomorrow afternoon, transitioning to all light snow Wednesday night. Again by Wednesday evening, around a half inch of snow will be possible by Wednesday evening. The rest of the week features scattered flurry chances, with high temperatures stuck in the upper 20's through the weekend. We've been talking about how warm its been this January, and in the previous post you can see how much warmer than average it's been this month. Through the end of last week and this weekend, we've had a long stretch of mild days. Since January 19th, temperatures in Rockford have made it to or warmer than 40°. With today's forecast in the low 40's this would make five consecutive days at or above 40°. For Rockford, the last time that happened in the month of January was four years ago, the 7th-12th in 2013. Another piece of good news, the sun sets tonight at 5pm. Spring is only 56 days away! If you've been feeling a little down the past two weeks, there is a good chance the weather has something to do with it. The sunshine Saturday was an absolute treat, but Mother Nature was quick to bring back the fog and cloud cover Sunday afternoon. Although the clouds did break up just in time to create a beautiful sunset! Fog sets back in tonight with temperatures falling into the low to mid 30's. It shouldn't be as dense as it has been the past couple of nights because of our northwest wind. But Monday looks to be at least another mostly cloudy afternoon. Over the past two weeks, skies have been either cloudy or mostly cloudy. There have been days where we have seen the sun, but it was either quick to hide back behind the clouds or came out too late for us to enjoy. Despite the cloudy days, temperatures have been running well above average. Our monthly average highs are four degrees above what the monthly temperature average should be! Our above average afternoons likely have a lot to do with just how warm our overnight lows have been. We've seen very little snowfall this month and with no snow to help keep the ground cool, overnight lows have not cooled off like they normally do during this time of the winter season. An upcoming pattern change does bring a 'cooler' pattern by the middle to end of the week. But it's cooler to us because we're used to the warmth. Temperatures will actually be more seasonable for the end of January. If you're looking for any accumulating snowfall with this temperature change, you're going to have to keep looking. Right now it only looks like a few flurries or very light snow showers are possible later in the week. It sure was nice to see the sunshine Saturday afternoon. Unfortunately, it didn't shine bright for everyone. High temperatures where the sun did shine reached the low to mid 50's! And it sure did feel nice. Saturday's high of 55 degrees did fall short of the record high of 60 degrees set back in 1906. Either way it was nice to get a little extra Vitamin D, especially considering how cloudy it has been this month. Skies will remain mostly cloudy through Monday, but we may be able to see some sun Tuesday before our next weather system moves into the Great Lakes. 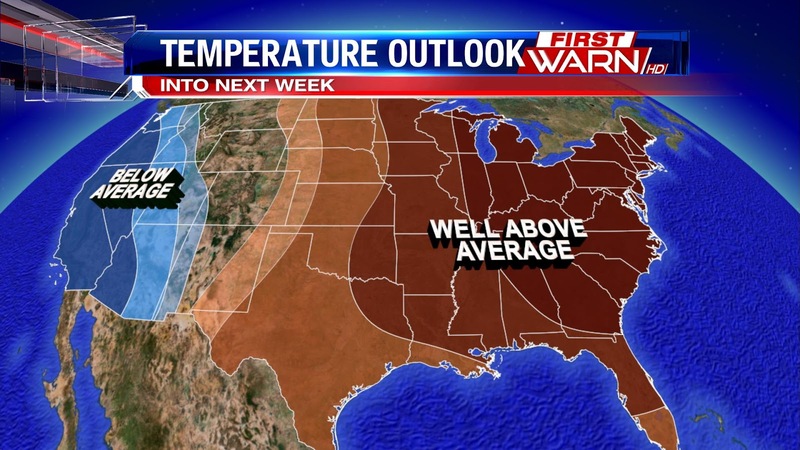 Temperatures the past week and a half have been, for the most part, running above average. And the warm trend continues through the weekend and into early next week. But there are some signs pointing to a pattern change that will bring a return of the winter chill. A series of low pressure systems will move through the Midwest and Great Lakes over the weekend. Light rain will occur with a warm front late Friday night and into Saturday, but for the remainder of the weekend most of the rain stays south and east. Winds will shift around to the north during the day Sunday and Monday. Highs will continue to range roughly ten degrees above average early next week, but a stronger low pressure system will develop over the central Plains late Monday and early Tuesday. This low will track northeast from Kansas to Missouri and into northern Illinois late Tuesday night and early Wednesday morning. Rain showers are likely ahead of the low, but depending on how fast cooler air wraps in behind the low and the track of the low, a rain/snow mix is possible during the day Wednesday. Following that, a strong low will develop over the Great Lakes and northeast keeping several waves of energy rotating into Wisconsin and Illinois. With temperatures falling around 30 degrees and then into the upper 20's by the end the next week, the chance will increase for light snow rather than light rain showers. A Dense Fog Advisory has been issued for all of northern Illinois and southern Wisconsin Friday evening through Saturday morning. Visibility has quickly fallen Friday evening, with some locations only reporting a few hundred feet. With this type of dense fog, driving can become difficult as we lose daylight. Please use caution if you're heading out this evening or very early Saturday morning. A warm front lifting into northern Illinois later tonight with allow a few showers to develop and that may help visibility during the overnight. But where the precipitation remains just drizzle the dense fog will continue. Winds will increase once the warm front passes Saturday and this should help visibility improve. Skies will remain mostly cloudy Saturday, but temperatures will warm close to 50 degrees. The recent cold snap allowed ice to quickly form on local rivers. But the warm up has caused the ice to break apart and travel down river. Unfortunately, ice jams have been developing along the Rock and Pecatonica Rivers causing flooding in a few communities. Ice jam flooding is different than heavy rain flooding. It's more localized and occurs with very little warning. A Flood Advisory is in effect for the Pecatonica River at Shirland and for the Rock River at Dixon. An Areal Flood Warning has been issued for the Rock River near the Ogle/Lee County line near Grand Detour, IL. Ice spotters have reported ice jams with flooding occurring Thursday afternoon. This picture is of the ice on the Rock River in Grand Detour. If you look closely at the tree line, you can see just how high the river has gone. The rainfall Thursday evening won't be anything like what we experienced on Monday, but the added rain won't help. Scattered showers will continue on and off through the weekend, but totals should remain light. The river gauge in Bryon is quite interesting to look at. Notice how the river level rises Monday due to the heavy rain, but then quickly drops and then rises again. For a time the river did reach minor flood stage, with homes being reported flooded south of Byron. The rapid rise and fall of the river level (assuming it's not malfunctioning) is likely due to ice jamming. The ice jam causes the water to back up upstream and slow down. Once that jam breaks apart, the river water is flowing again - until another ice jam occurs. This is why ice jams occur with little warning and residents along the rivers need to keep a watchful eye on river levels. 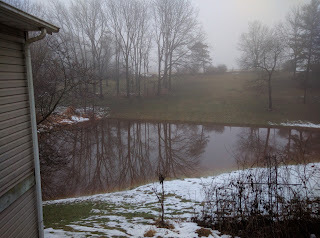 It's been a soggy January so far, not with snow, but with rain. We talked earlier that the Rockford area broke a record for daily rainfall on Monday, receiving a little over an inch. With recent rain and ice jamming, local area rivers have been rising. There are currently a few river flood advisories across the area that we will need to keep an eye on, with even more rain coming. Rain will be arriving late this afternoon from the south and will be lifting north, starting at about 4pm. One item of note is the position of the jet stream in the upper atmosphere, oriented from southwest to northeast. Its originating in central Mexico, which is its pulling warmth but also moisture to northern Illinois and southern Wisconsin. This is bringing a lot of moisture to the area for the month January, rain totals for the area will reach around .25" to .50" but locally higher amounts are possible in any embedded storms we have tonight. We can't forget though, that we're still in the dead of winter, and our ground is still frozen. This will allow for a lot of runoff concerns and localized flooding or ponding. Temperatures will be continuing to warm, so we really don't have a freezing concern through the weekend. There will be a few showers that will be possible Friday night and through the weekend, but they don't really amount to much. Next week, the next system passes south of us on Monday. We spent most of Wednesday under thick cloud cover and foggy skies. It wasn't until mid to late afternoon that some sun was able to peek through. But by Wednesday evening, the cloud cover had filled back in and fog was beginning to redevelop. As a result of the cloud cover temperatures Wednesday stayed in the low to mid 30's, not reaching the forecast high of 41 degrees from the previous night. So, what kept the cloud cover and fog around? Well, we have warm air to thank for that. An inversion developed in the atmosphere that helped trap moisture near the surface of the earth. With nowhere for the moisture to go, the cloud cover and fog didn't 'burn off' in time like we were hoping. An inversion develops when warm air a few thousand feet above in the atmosphere moves over a relatively cooler surface layer. Temperatures roughly 3,300ft in the atmosphere warmed to just under 40 degrees Wednesday morning, while temperatures at the surface were a little above freezing (32 degrees). The warmer air above doesn't allow the air at the surface to rise and keeps the atmosphere from mixing. Because of this, moisture is 'trapped' near the surface of the earth keeping cloud cover and fog from clearing. When this happens in the late spring and summer, the clouds and fog are quick to burn off. When it happens in the winter, the sun isn't able to heat up the atmosphere as efficiently due to the lower sun angle. There was enough clearing to take place Wednesday evening to allow more fog to develop. It's possible that locally dense fog may occur overnight into Thursday morning. If this happens again, highs may have a hard time reaching the low 40's - just like Wednesday afternoon. The January thaw continues this week with temperatures continuing to climb. Temperatures by this weekend have a good shot at making it into the low 50's. With that however, comes multiple rain chances through Monday. It all is attributed to our jet stream pattern; fast moving 'rivers' of air in the highest levels of the atmosphere, often called our 'steering winds'. The first branch of the jet stream, the polar jet, has retreated north of the United States. This essentially trapping the cold arctic air well into Canada. However, the more active jet has also lifted into the Mid-south and will steer low pressure systems near the area bringing with it warmth but also moisture. Our next chance for rain arrives Thursday afternoon ahead of warm air that will keep temperatures in the mid 40's for Thursday. Even a few rumbles of thunder will be possible just south of the area, and rain will continue into early Friday. With that, current forecast brings an additional half inch of rain into Friday. Rain moves out early, but scattered rain chances then continue into the weekend. Over an inch of rain fell Monday, breaking the daily rainfall record for Rockford. 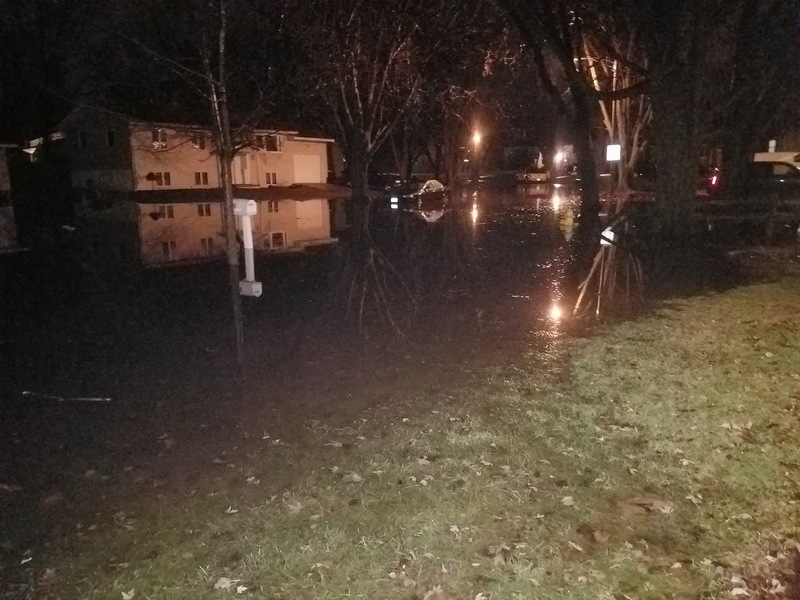 But what that rain also did was cause a lot of standing water in fields, backyards and ditches, and caused some of the local rivers and streams to rise. A Flood Advisory has been issued for the Rock River just southwest of Rockford down to Dixon. River levels have gone up since Monday afternoon at both Byron and Dixon, reaching action stage Tuesday afternoon. This means the water will come very close to edges of the banks, and residents in low lying areas along the river may experience some flooding, but widespread flooding is not expected. River levels should remain below flood stage. 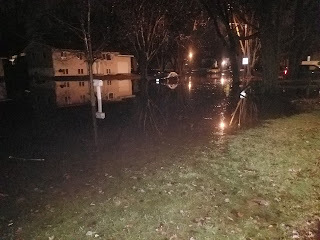 streams, and cause more back yard flooding. Scattered rain showers are expected through the weekend. 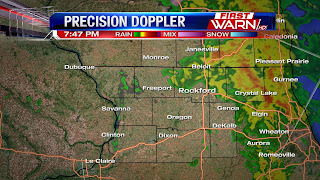 It was a slick and soggy Monday across the Stateline, and record breaking rain was recorded in Rockford. 1.01" fell Monday breaking the old record of .85" set in 1935. Overall it has been a very soggy January, with 1.39" of rain falling so far. The average for the month to date is .76" bringing the area to .63" in surplus. Looking forward this week, we still have a nice warm up on tap with highs making it into the 40's and 50's are in reach. By the end of the week we bring in small rain chances, though it looks more likely on Monday. I counted quite a few folks who didn't have their headlights on Monday afternoon on my way into work. When your windshield wipers are going your headlights have to be on. It's the law. But when it's foggy your headlights should be on as well. This is so other drivers can see you from the front AND back. The tail lights do not turn on when just your daytime running lamps are on, so traffic coming up from behind may not be able to easily see you. With the potential for dense fog Tuesday morning, it's important that everyone remembers to turn their headlights on. The freezing rain came to an end late Monday morning and early afternoon with air temperatures warming above freezing. Since then, it's been a steady rainfall through the afternoon and evening. There will be a break from the rain coming up after roughly 8pm, however, additional showers are likely with the passage of low pressure overnight and early Tuesday. Surface temperatures are, for the most part, above freezing. However, there were several reports of accidents in Boone County earlier Monday evening due to some icy roads. Even though the surface temperatures are above freezing and will remain above freezing overnight, pavement and sidewalk temperatures are beginning to fall below freezing. This will cause the lesser traveled roads to become ice covered once again. Because of this, the Milwaukee National Weather Service has reissued a Winter Weather Advisory for Green, Rock and Walworth counties through 6am Tuesday. Icy roads are not going to be a major issue, but please be mindful that there could still be some slick roads. And watch out for your back deck, sidewalk, driveway and parking lots. With the rain coming to an end and low pressure passing overhead Monday night, locally dense fog will develop. Visibility has already fallen between one to two miles in a few locations and could fall even further into Tuesday morning. Drier air will arrive by Tuesday afternoon helping to get rid of the fog, but skies will remain mostly cloudy. Additional showers are possible during the late afternoon and evening with skies turning partly cloudy Tuesday night. Many drivers finding issues on the roads this morning with freezing rain across the entire Stateline. A Winter Weather Advisory continues for the entire area until noon today. Though we will notice some improvements before that as temperatures slowly warm above freezing. Travel is not advised through the morning, with multiple accident reports. IDOT reporting US-20 at and west of Freeport as ice covered. 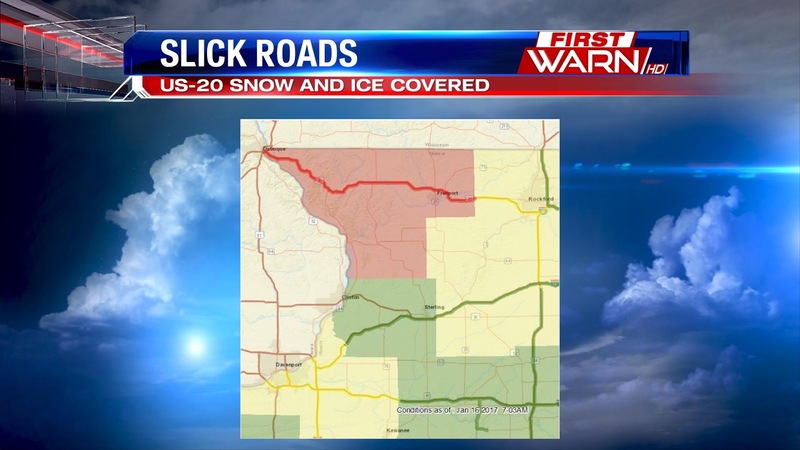 I-39 and portions of I-90 are partially ice covered. Side streets, along with residential and parking areas are very icy as well. Temperatures are still at or below freezing so the freezing rain potential continues.You can check current road conditions here. 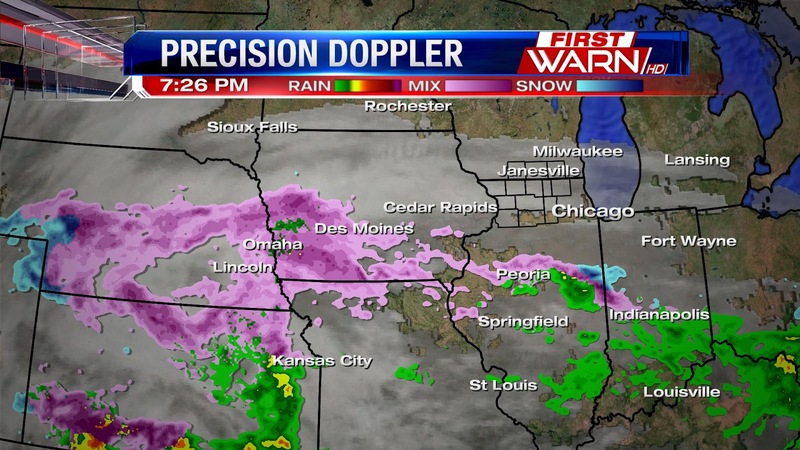 To the west of the area driving conditions are even worse with Ice Storm Warnings in place through central Iowa. To the south of the area, Dense Fog Advisories are being issued with moisture trapped below warm air. For the Stateline slick travel will continue through 11am, then it will be soggy and foggy. Scattered showers will persist through the afternoon and fog will continue to thicken, dropping visibility. Areas of rain and fog will continue through the evening and into Tuesday. Conditions outside will be changing fairly quickly from Sunday night to Monday morning. A strong low pressure system will lift northeast from the southern Plains into the Great Lakes by Tuesday morning. 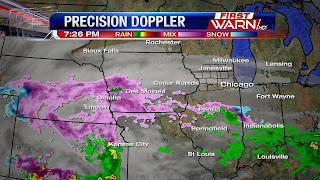 Sunday evening a mixture of rain, sleet and freezing rain has been occurring over northern Missouri, Iowa, Nebraska, Kansas and central Illinois. 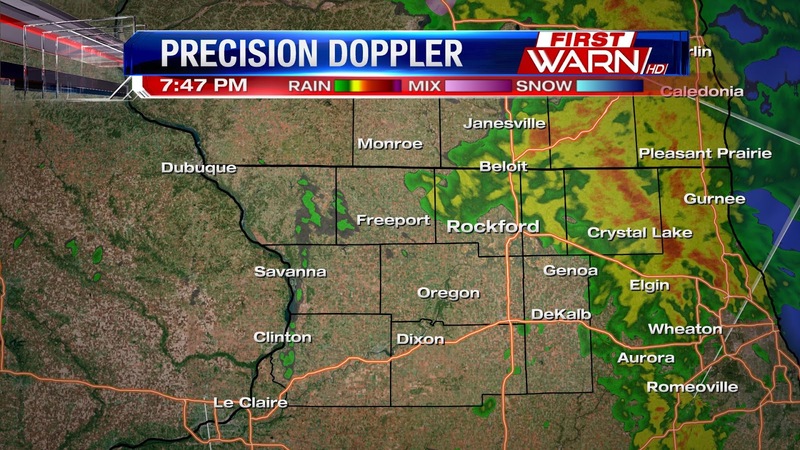 All of this precipitation will remain south of the Stateline through Midnight, and likely through 2am or 3am Monday. Surface temperatures over northern Illinois and southern Wisconsin have fallen into the upper 20's and low 30's and are not expected to rise back above freezing until Monday afternoon. As moisture is pulled north it will encounter the colder air at the surface. This will lead to a period of sleet and freezing rain from very early Monday morning through roughly Noon. Minor ice accumulations are likely with some locations receiving up to 0.10". This isn't enough to bring down power lines or cause power outages, but it is enough to cause issues on the roads. A Winter Weather Advisory has been issued for northern Illinois and southern Wisconsin beginning late Sunday night and lasting through Monday afternoon. By Monday afternoon, surface temperatures will have warmed slightly above freezing allowing a transition over to rain to occur. This looks to happen anytime between 11am and 1pm over northern Illinois and between 1pm and 3pm over southern Wisconsin. Temperatures the first two weeks of January have been up and down. From 51 degrees on the 10th all the way down to 7 degrees on the 6th, we've had quite the range in numbers. Highs Friday were in the teens and low 20's thanks to an abundance of cloud cover. Weekend temperatures will remain fairly seasonable with highs right around 30 degrees, but there are strong signs pointing to a significant warm up beginning the middle of next week and lasting through almost the end of the month. 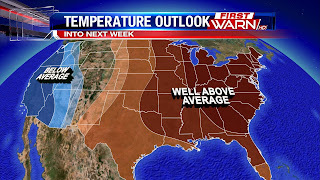 The 6-10 day outlook from the Climate Prediction Center highlights the middle and eastern part of the country with a high probability of above average temperatures. Average highs for Rockford are right around 29/30 degrees. Temperatures beginning next week will run anywhere between 10 to 20 degrees above average, with highs possibly reaching the 50's next Friday and Saturday! High pressure building overhead today will help to keep the Stateline area fairly quiet this weekend, despite a brief chance for a light rain snow mix or light sleet late tonight into early Saturday morning. However, the commute Monday (if you have one) yet again has the potential to be a mess. A strong low pressure system will slowly lift north into the central plains late Sunday and then will move into Iowa and southern Wisconsin. With the current track northern Illinois and southern Wisconsin will stay mainly on the warm side of this system. But at first, temperatures will be cold enough at the surface to support sleet and freezing rain late Sunday night into Monday morning as moisture is directed north. High pressure helps to direct moisture flow as its positioned over the mid south. With a shallow cold layer, freezing rain and sleet will be likely late Sunday into Monday. Ahead of the low, there will be quite a bit of warm air advection over Illinois which will bring allow that transition to all rain Monday afternoon into Tuesday. Along with that, temperatures will make it into the 40's Monday and lasts through most of next week. Temperatures will reach 15° above average!